Educationally Minded | What exactly is education? How should students receive it? I just realized that I posted on the wrong site. Here is the link to the correct “Time Served” post. This morning I was watching Today Show and they shared a story about how children who are over scheduled are not developing correctly. Some of that development is not knowing (what I feel to be) common knowledge information. Over-scheduling children is not allowing them to have the free time that they need to learn on their own. It may also be keeping them from being successful on their own. As a teacher I’ve heard several reasons why students need to have the team building outside of school because in the classroom students are just study, learn, sit and other non-physical activities. Parents want their child to be able to work well with others and I agree, but I know some students who are in football, then wrestling, then basketball, then swimming, then baseball throughout the entire year. Some kids never get a break. Now, I know that we can’t just blame parents for not allowing play. Recently there have been several articles about Finland allowing free time during the school day for kids to play. So schools do need to allow more free time. However, in most schools the test scores are low, so they take away that recess time. How do we go about changing the mindset of Americans that free play time for kids is healthy. When I was a kid I was told to go outside and play. Were there times I was bored? Heck yea! I would go inside and say I was bored and my parents would say, “Go outside and find something to do.” They didn’t hold my hand and find something for me, they made me go away. I had to become creative and learn to play on my own. I’m not trying to blame anyone here, I’m just sharing that I feel kids need more free time. They need time to just play and be kids. Heck, even adults need more time to just play and have fun. When was the last time you went and threw around a football? When was the last time you played with an empty box? When was the last time that you were creative and not just sitting in front of the television? The paintings above are what I did this past week. I want to have color in my classroom this year and so I’m trying to create pieces of art that also have some math in them so I can turn to them when needed. It’s time to be creative. It’s time to have free time. It’s time for EVERYONE not to have such busy schedules. Too many times we try to do things on our own. Sometimes, when trying to be “the hero” we get bogged down and stressed. 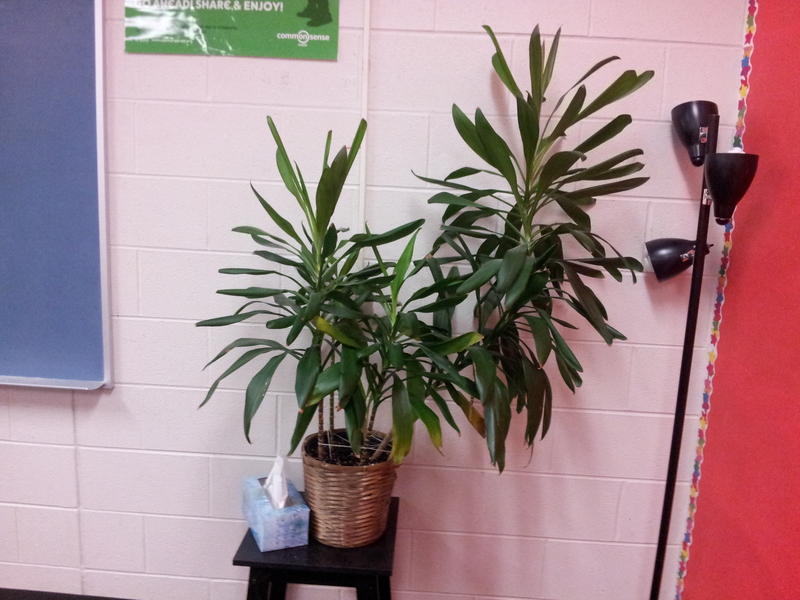 I have a plant in my classroom that over the past year I’ve been watching grow and leaning to one side. I have placed a ruler under the right branch. I’ve tried using string to help pull that side up. 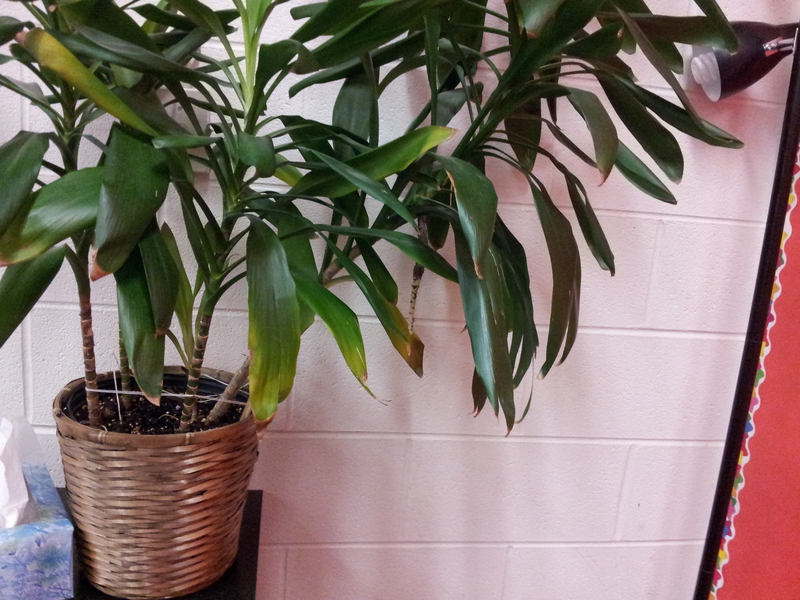 I had to be the hero for this plant so that it wouldn’t fall over or die. Yesterday as I was watering my plants, I noticed something. I thought something looked odd. What’s happening to my plant? So I got closer. Do you see it? It’s not a leaf, but it’s coming out of the stem that should have a leaf. It looks like a root . . . .wait. . . .I think it is. I asked a few others to come and take a look at it and we all agree that it must be some sort of support stem/root coming out of the plant. 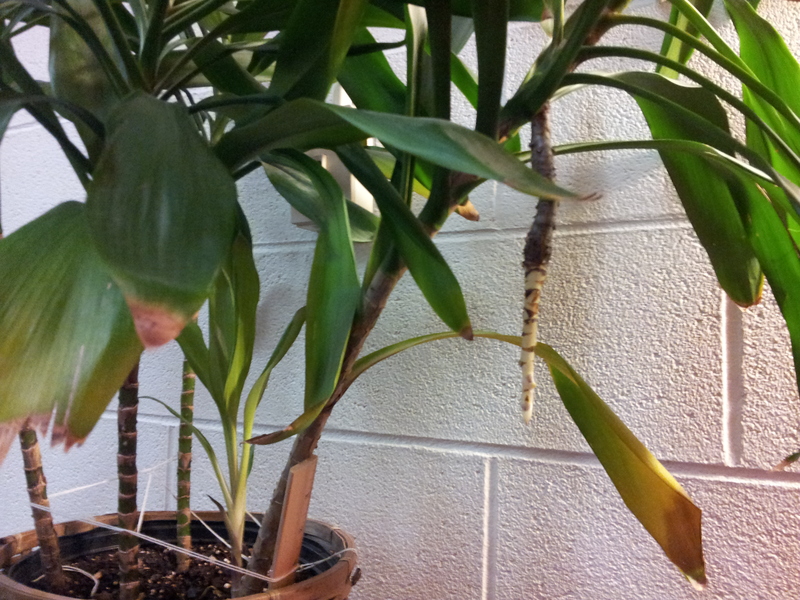 This plant knows that if it continues to grow in this fashion with the stem leaning, that it could be harmed and not survive. To help itself, it’s growing a new stem, looking for ground, so it can support the long branch that is not over the rest of the plant. In the same manner as this plant, we as humans need a support system. We need others who are there to help us when we start feeling pressured and bogged down. We need assistance at times. However, that system of support is not just handed to us, we have to find it. We are not able to create new people, as this plant is creating a new stem. We have to search out for others who can support our beliefs and say that what we are doing is right for students. That’s one reason why I’m on Twitter. I collaborate with the teachers in my building daily, however, if I only did that, then I wouldn’t see all the fresh ideas that are out there. Our plant of a building cannot survive without the support and ideas of those outside of the building. 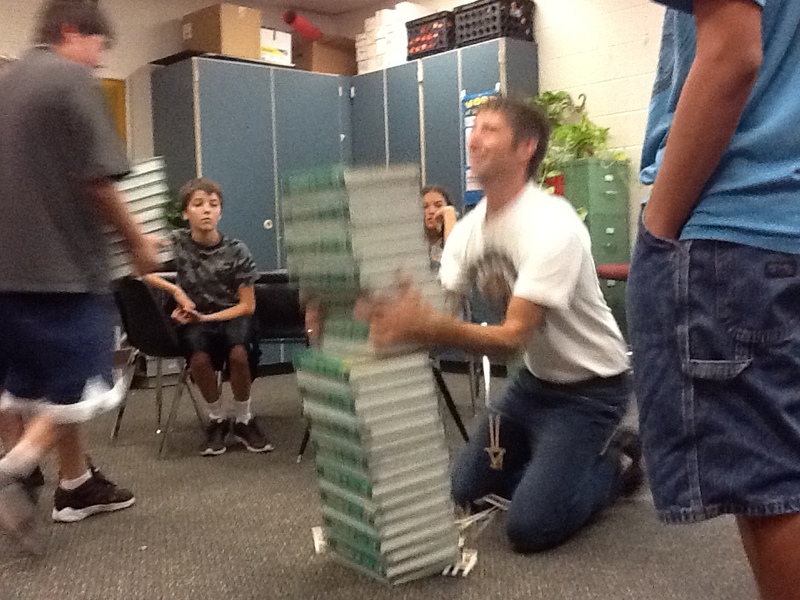 I bring in ideas and share with teachers all the time. Don’t be afraid to reach out and look for that extra support. To begin, I want to have a disclaimer. I am in no way receiving compensation for this blog post. 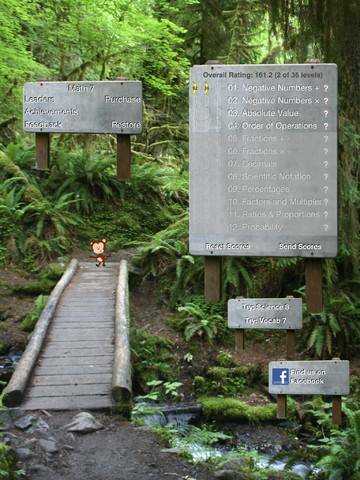 I have found an iPod/iPad app that I have enjoyed in the classroom and want to share it with everyone. This past summer I received an iPad through a math grant in our district. I am a big believer of using technology in all classrooms. One app that I found right away is called Middle School Math 7th Grade. It’s a great app that allows students to review many aspects of math. I had students this summer play it a little. 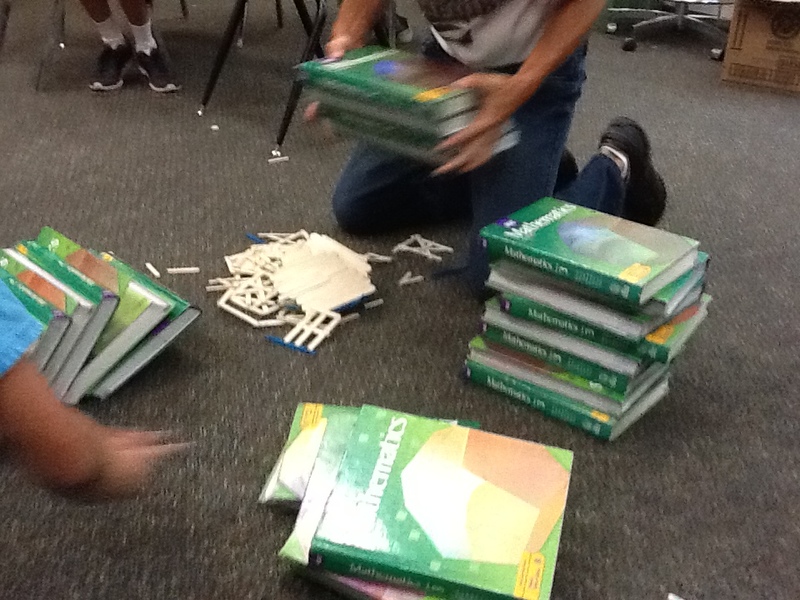 They enjoyed trying to get the monkey to the bottom while solving problems. However, as you are moving the monkey, he will freeze and a math problem and 4 possible solutions will appear. In order to move on the player needs to solve the problem. If the answer is correct, then the problem goes away and you continue to move down. If the answer is incorrect, it will highlight the correct answer (giving instant feedback). The monkey does move backward though if incorrect, so it will take a little longer to reach the bottom. 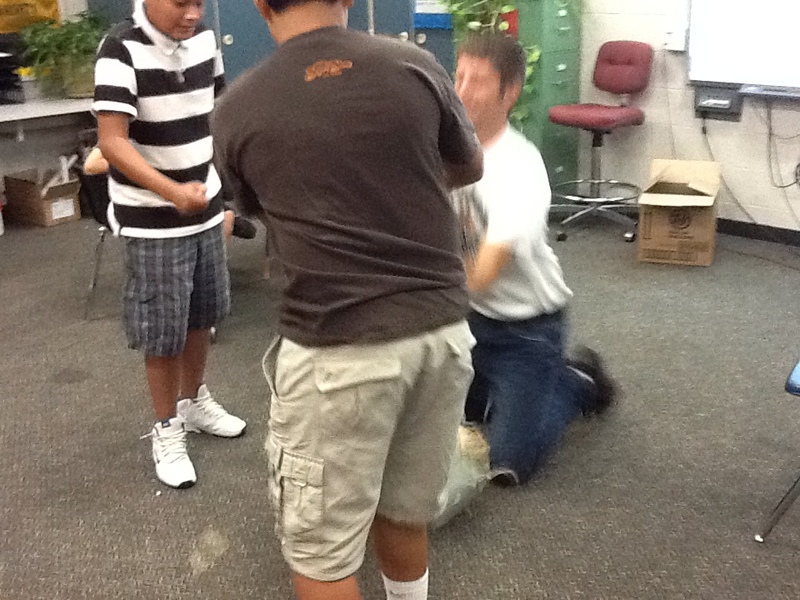 There is a timer in the upper left hand corner that is timing the activity. I have allowed students to use paper and pencil, but most choose not to. If they use the paper, it may take a little longer, but they get the answer correct more often. I think if we can focus on correct answers and not time, more students will choose to use the paper and pencil to help themselves. 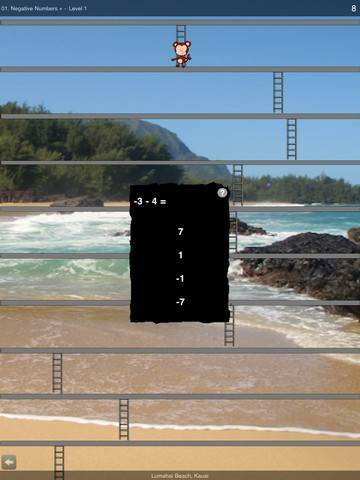 When the monkey reaches the bottom all the problems and answers are shown on the screen. This allows the student to go back and look at their answers. I also feel this would be a great screen for the student to show the teacher. At the end of the class period, you can have the student email their results to you, which is great! 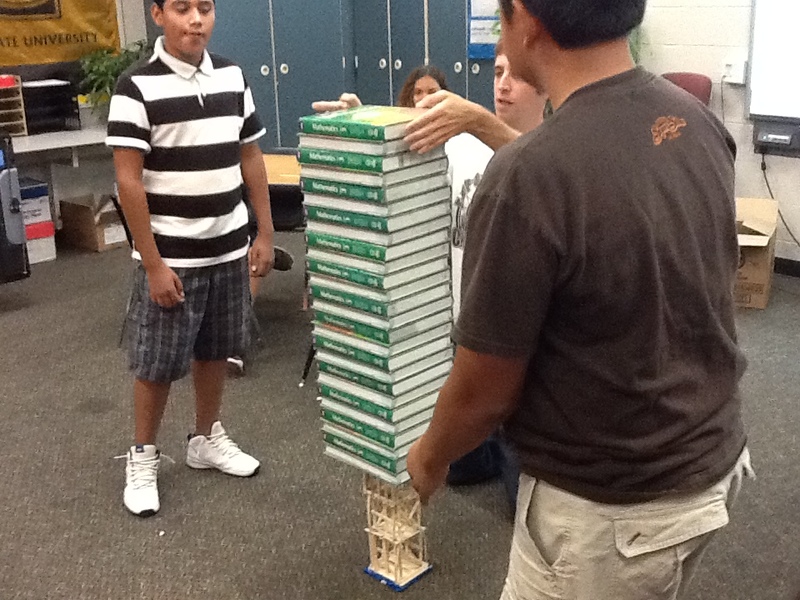 It gives you, the teacher, a chance to see how students did and what problems they may have difficulty with. Now, the reason I’m writing about this is because I received an email from the creator the app this past week. YES!!! I was excited!!! I took a look at the reports they sent me and I love them! 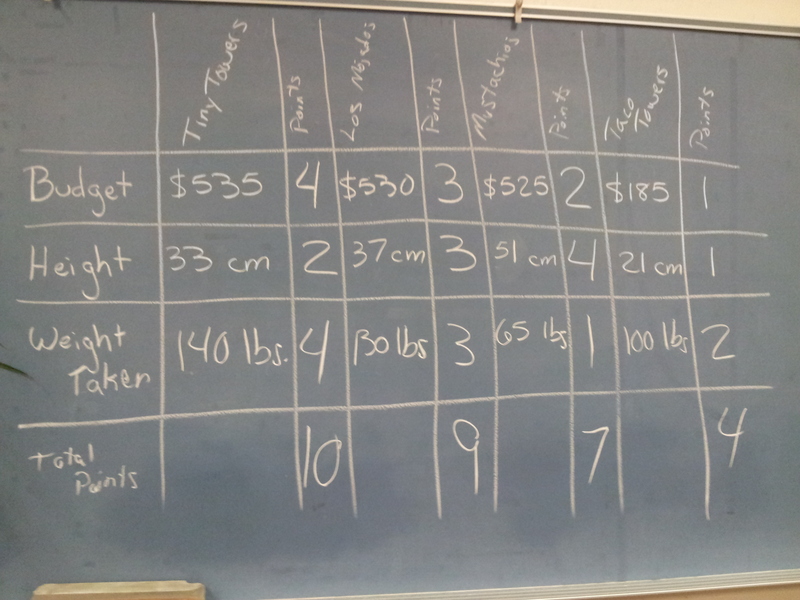 I had students work on adding integers. The information I received makes me look at my lesson plans and figure out when I can get the iPads in my classroom again to have the students redo the level again to find their improvement. Knowing that the creator is sending overall information to me lets me know that he cares about student improvement. Now, I do have to say that the first four topics are free and the remaining 8 have a cost of $0.99. After getting this email and information from the creator, I can say that the cost is VERY doable. Knowing that I can get feedback with all the student information and not just the email the individual student sends makes it a great app. 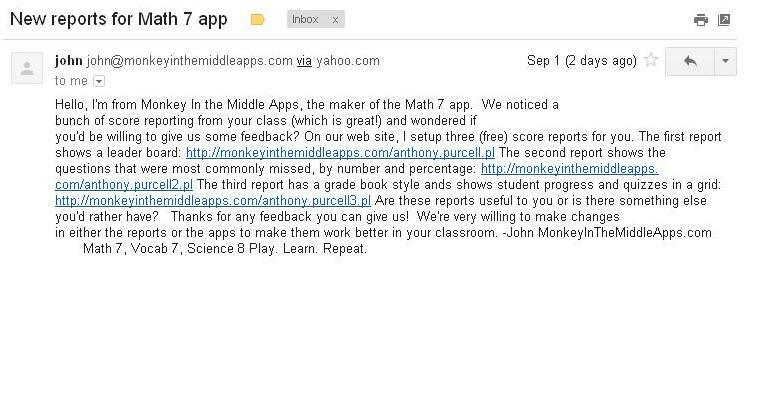 There are other apps out there with the monkey moving through obstacles to help students learn and remember information. I encourage you to take a look at this information and help your students learn. Disclaimer: I am not receiving compensation for this post. I am just passing on word of a great app for educators. This past week I started to think about how long it’s been since I’ve written a post. So this morning I get on and see I didn’t write a single post in the month of August. WHAT?!?!?!? Where did the month go? I’ll be honest, it flew by. I’ve been swamped with getting back into school. These may sound like excuses for not writing, but they are not. I just need to find my new balance. For starters, we moved our start time to 7:35 am. Last year it was 8:50 am. So for me, that’s 1.5 hours less than what I had before. I still wake up at the same time, 5:00 am, but this gives me 30 minutes less at home and an hour less at school in the mornings. It’s amazing how much I was able to get done in that 1.5 hours last year. Also, we extended our day by 48 minutes from last year. That may not seem like much, but I’m feeling it. I am just exhausted as I leave school each day. I still try to stay and work some, but my mind is just gone. It’s really difficult to work. I thought it was just me, but I’ve talked with some other teachers this week and they feel the same way. I also will be part of a mentoring program this year, due to changes in State Licensing, so I’ve been reading “The First Days of School” by Harry Wong. This book has been great. 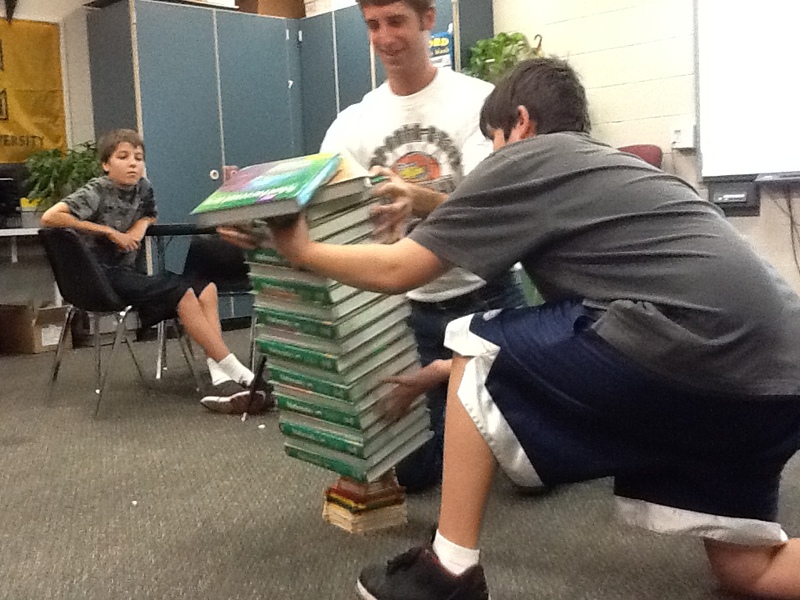 It backs up many things that I do in my classroom, as well as giving me many great ideas for what I can do. I was able to hear Dr. Wong speak a little at the National Teacher Hall of Fame dinner this past summer. What an inspiration he is. Student Council is going great so far! My eleven 7th and 8th graders have been awesome in getting things decorated for the year, helping the 6th graders feel welcome, and plan many great things for the school year! I feel this year is going to be EPIC! This next week I go and talk with the 6th graders to have them come and be a part of our leadership team as well! So, as you can see, I’m not making excuses, I’m just going crazy! I know I will find a balance soon and be fine. For now though, on this Saturday of a three day weekend, I have lesson plans to write. Have a great weekend! I promise not to go a month without blogging again. It’s been three days since we ended the two week Tiny Tower Project session. I’ve had some time to sit and think about the project. What would I do differently next time? What was great about the project that hooked the kids? First, the kids were hooked. They loved it! At the end of Thursday I asked the kids what they thought of the project (next time I need to have a reflection piece written by them). They said they enjoyed it. 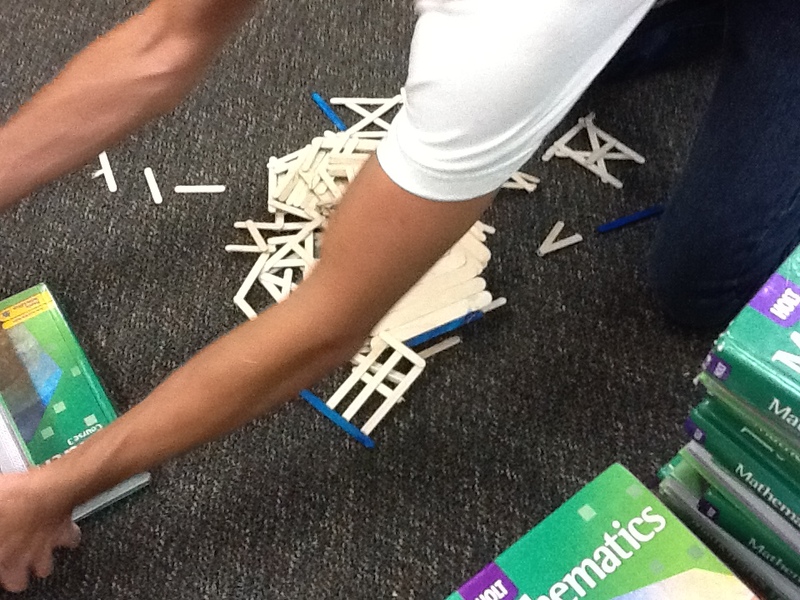 It was a chance to build an object and see their results. 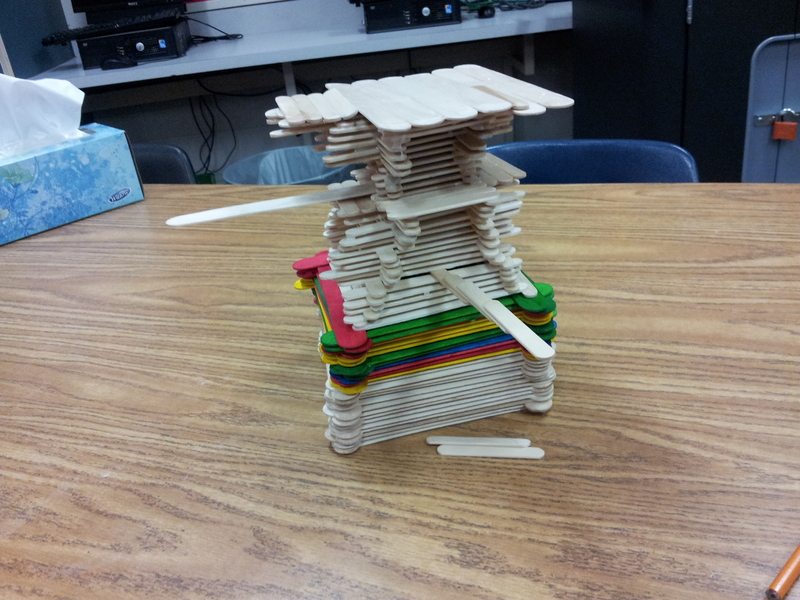 Of course, their favorite parts were the Tiny Tower game on the iPad and the building with craft sticks and glue. 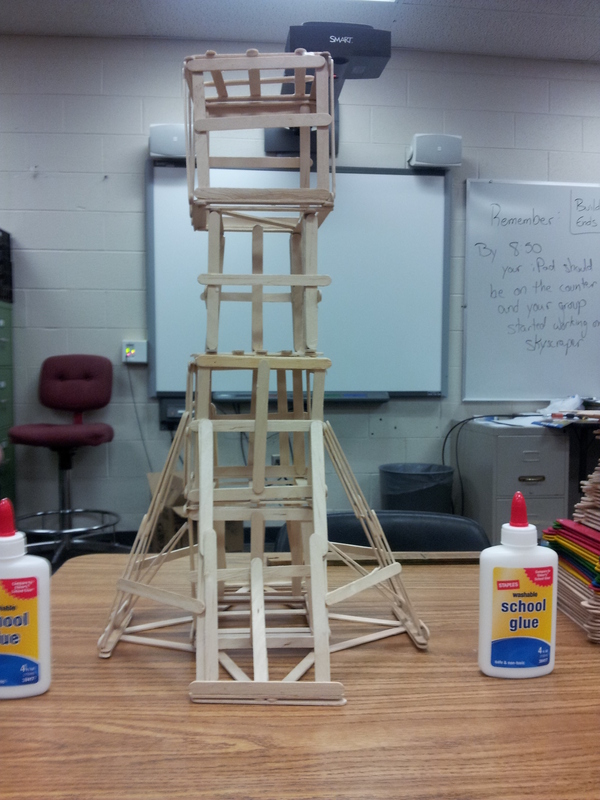 With the building side, I would make rules stating that there must be some sort of change on the tower each day. 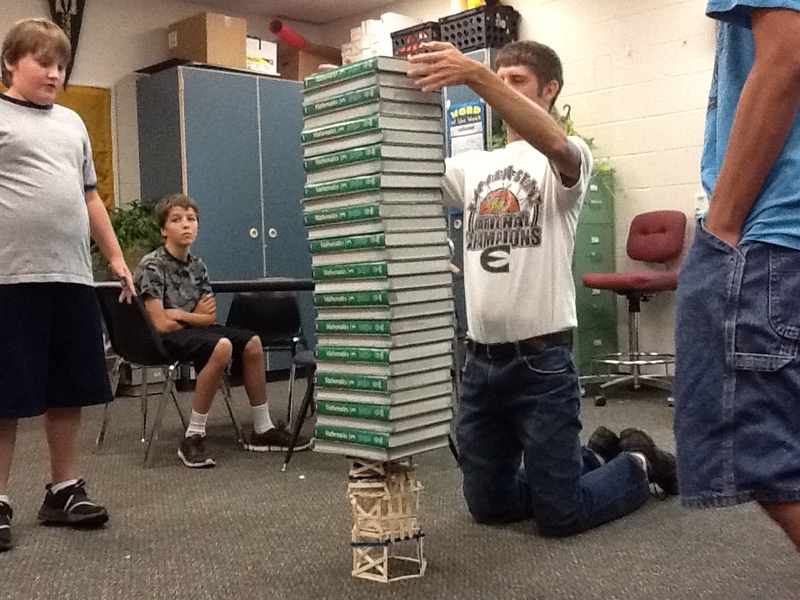 That would help prevent the students from quickly building their tower, then saying their finished. 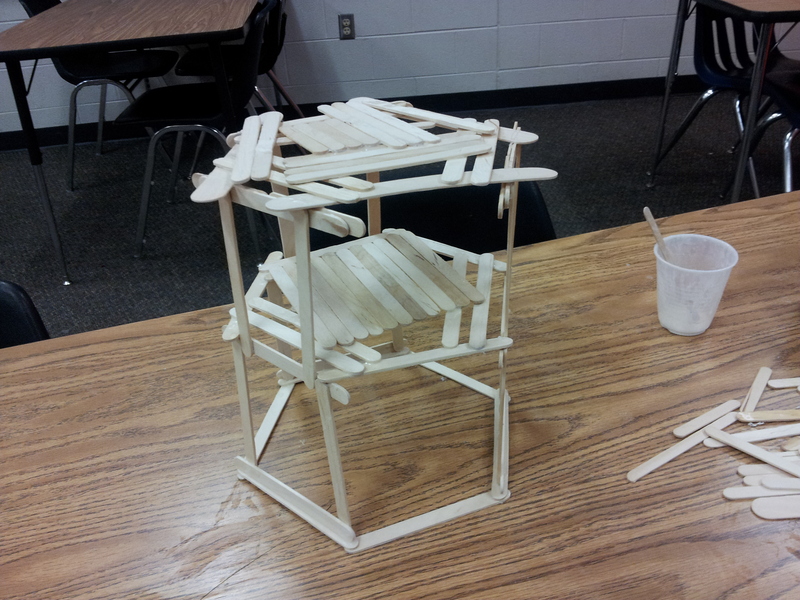 We had one group just sit the last 3 days of building because they were “finished”. They met the height requirement and didn’t want to build anymore. 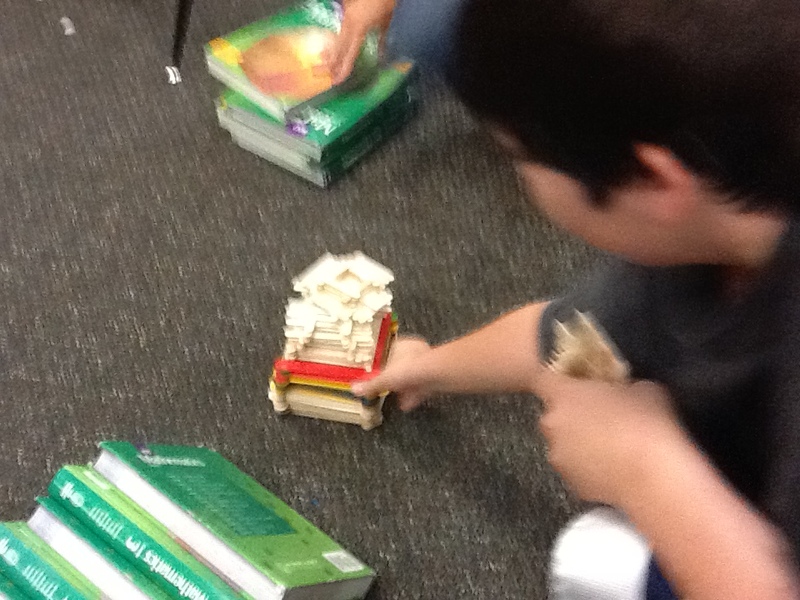 We said that one of the 30 minute building periods in a day was a no iPad time, hoping they would build more. Instead, they just sat there and talked. A couple of times they needed to be reminded to quiet down. But then again, isn’t that how things work? If they are happy with their tower and just want to sit there, what’s wrong with it? I guess nothing really, except the couple of times they started to be loud. They did what they needed to do, and also were not bothering other groups. . . . so I guess making them have a change each day would be making the tower more mine and not theirs. A big change that I think would be good was the class discussion/researching times. 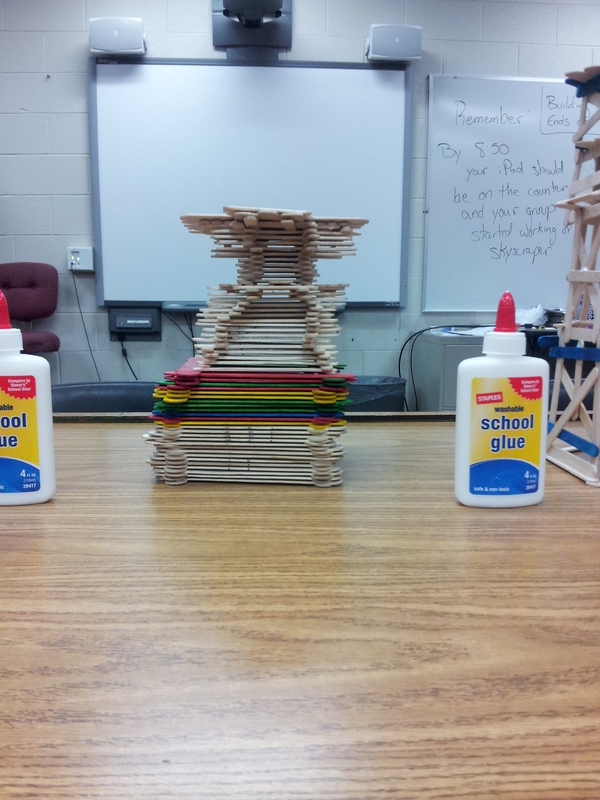 We had about two 40 minute periods each day. One was looking at the history of skyscrapers, the other was looking at budgets. What I discovered though is that we were having good discussions and had to stop them to move on with the schedule. A change I would like is maybe having one week just looking at the history and the next looking at the budgeting. That way discussions could continue and not be cut off. I understand that in school we have bells so that each student can get to all of their classes. However, how many times are we cut off because it’s time for the bell? There are so many times that a great discussion if going, then the bell rings. When you try to pick up the discussion the next day (or two days later on block scheduling), it can’t be done. However, that’s another blog post. I guess they big thing that I was excited about was that I got the kids hooked! Kansas University in Lawrence, KS has an annual Engineering Expo where students can compete in different events. 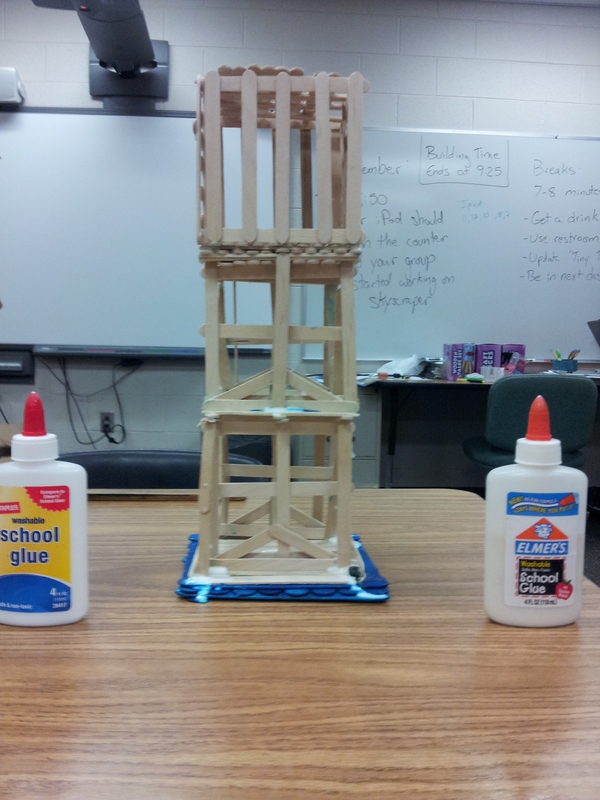 One of the events is building a skyscraper from craft sticks and glue. The regulations are a little different than the ones we had in the project, but kids want to go. I asked them how many would be interested in taking a day away from school and building a skyscraper after school. Most of them said they wanted to. These students are students who don’t want to be at school, but I have them hooked and they want to succeed in school so they can miss a day to go to the competition. I really hope they still want to go when back in school this fall. 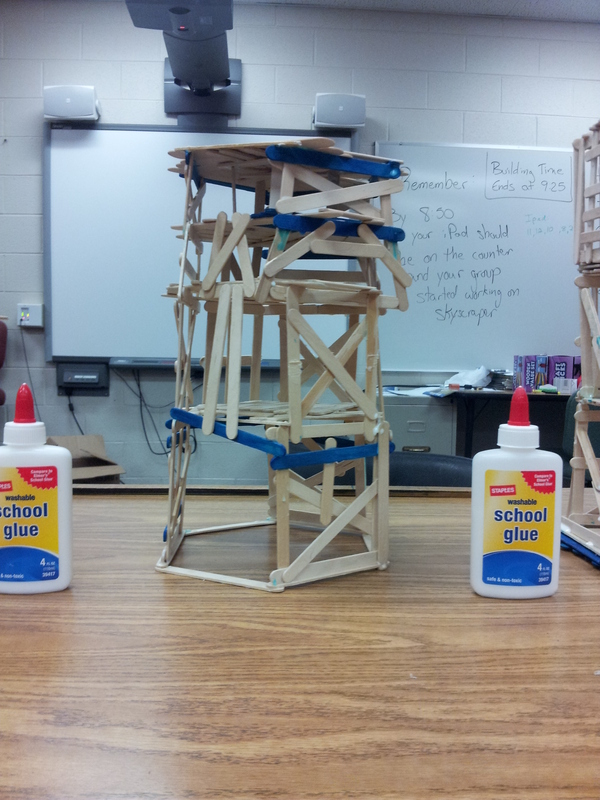 I feel the project was a success. 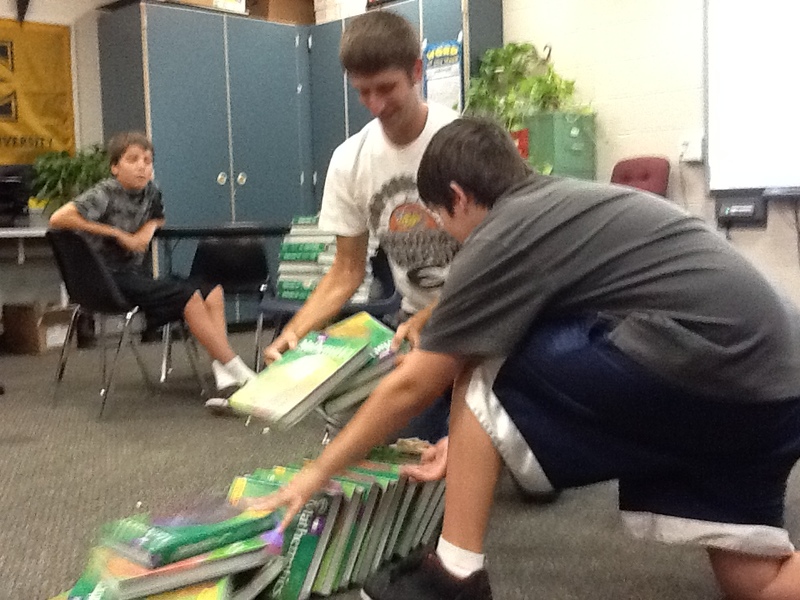 Students learned and they were excited each day to come. 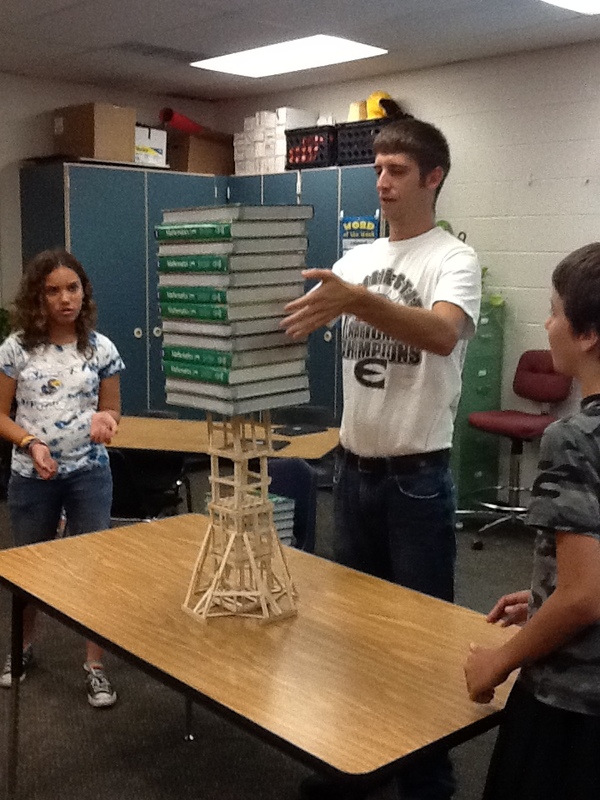 The following video is from last year’s KU Engineering Expo and the tower three of my students had built. 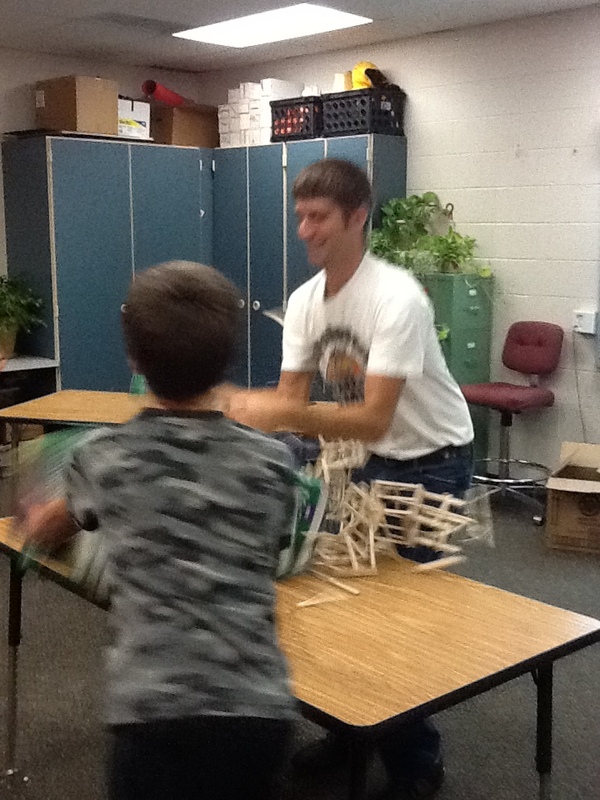 Kids came in today excited to see their towers be crumbled! Actually, they were quite sad to say the least. As you can see, they took quite a bit of weight. The results are below in the chart. 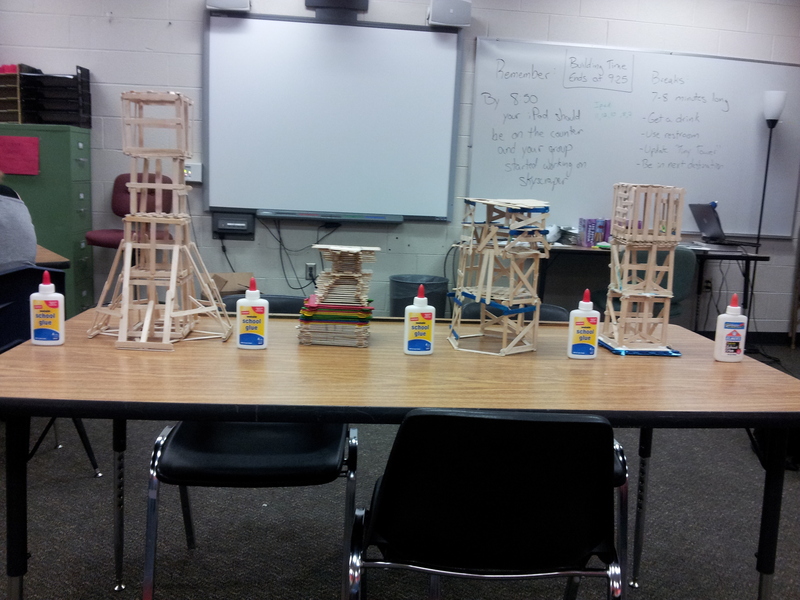 The towers are shown below. I have to be honest, I was not expecting the winner to be Tiny Towers. What is it that helped it win? The videos will be coming soon (I hope). One of the videos does not want to be copied from the iPad. I will write a reflection on the project over the next couple of days. I talked with the students today and they seemed to really enjoy the project. Stay tuned for the video release. Summer is a time for teachers to relax and not think about school. . . . or so many think is happening. I myself have been very busy with training, summer school, preparing for next year, and trying to have a social life. When I’m talking about social life, I’m talking about social media. Over the past several years I have gotten to know so many teachers through Plurk, Twitter, and even Facebook. It gets tough to keep up all the time. When I first was on Twitter, I would always go back to where I had left off before and read everyone’s tweets. I would click on their links of information they were sharing and was trying to just soak it all in! I loved being on Twitter. Then it became too much. During this past school year I started to follow more and more people, to where now I don’t see every tweet. It’s tough to tell yourself (and make yourself) not have to read everything. Just get in what you can. Also, you cannot possibly see everything. If you tried, you would be ALL THE TIME! That’s where I was at. I had to find a balance between my social media life and my physical life. This summer has been great. I’ve been teaching summer school and then going home and relaxing. I have read a few fiction books as well as a couple of educational books. It’s been a great summer of helping myself learn not to be in the know at all times. I have missed Twitter and Plurk a little this summer, but I know that I am starting to find a happy medium. I’m excited to be starting the school year up again in 3 weeks. It’s going to be a great time and I’m going to be learning myself throughout the year. Day 8 of Tiny Tower is today: students are now realizing that their towers will be destroyed tomorrow. I will post tomorrow about Day 8 and 9 and how the project ends! Disclaimer: My photo is of me on the wall in front of our school. Please stay off of the wall as the signs are posted. 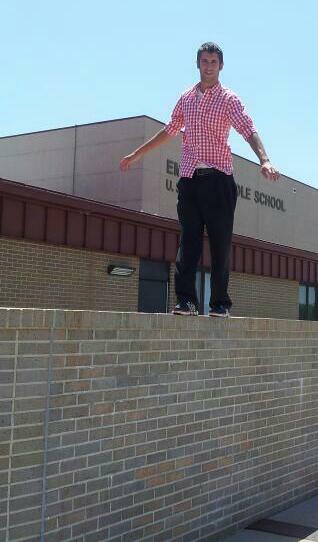 I had permission to carefully climb on the wall for the picture. 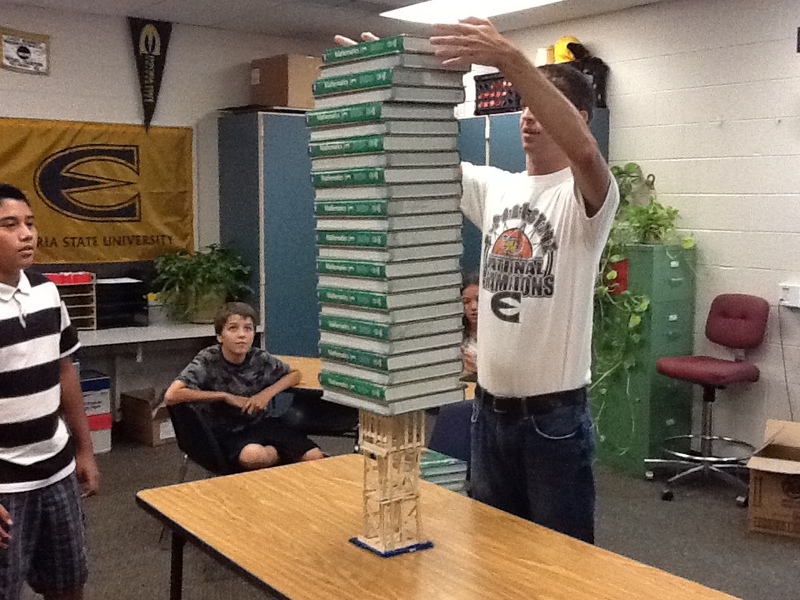 During the past two days students have been working really hard on finishing their skyscrapers. Day 8 is the last day to build with Day 9 being the testing day. They are coming along pretty well. There are only 3 here because the 4th tower is complete. . . .or so they say. During the past two days we have also looked at different ways to build skyscrapers. A big item that we have talked about is the World Trade Center Towers. We all know they were hit by planes in 2001 and collapsed, but were they a poor design. 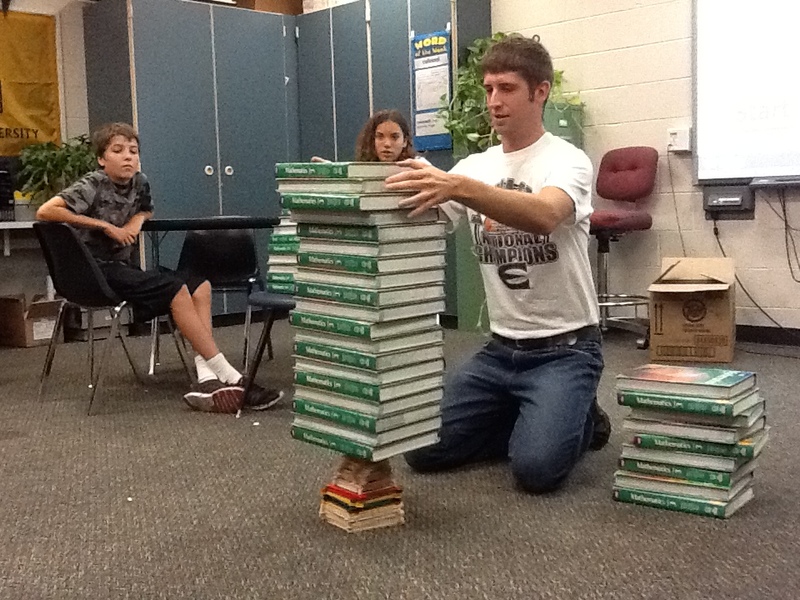 We read from the book Fantastic Feats and Failures about the towers. There are so many new ideas that were used in the design of the towers. We learned from them just as much as we were amazed at the buildings. 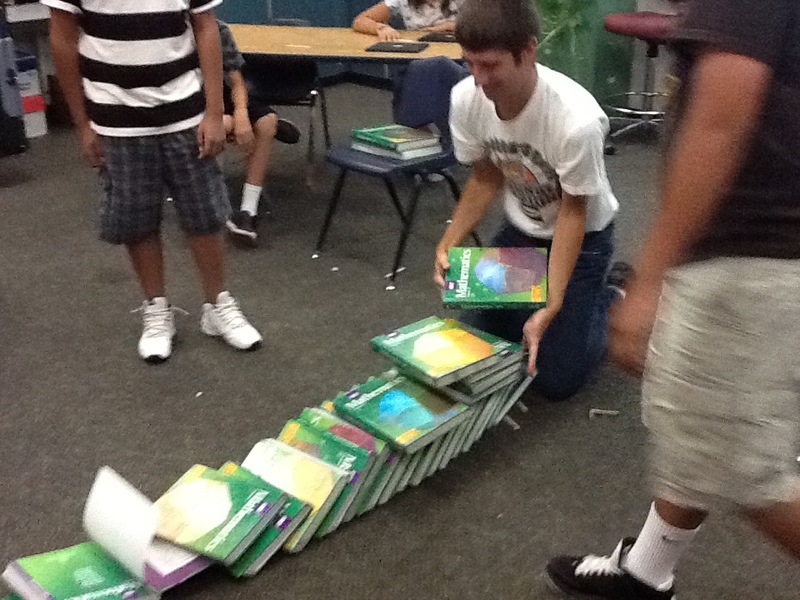 I feel it’s important for students to look at tragedies that have happened and learn from them. We hear all the time about how failing helps one learn and grow, but do we always look at big tragedies in that way? There are also so many different views about that day 11 years ago, that I think helping students understand opinions from facts is important as well. 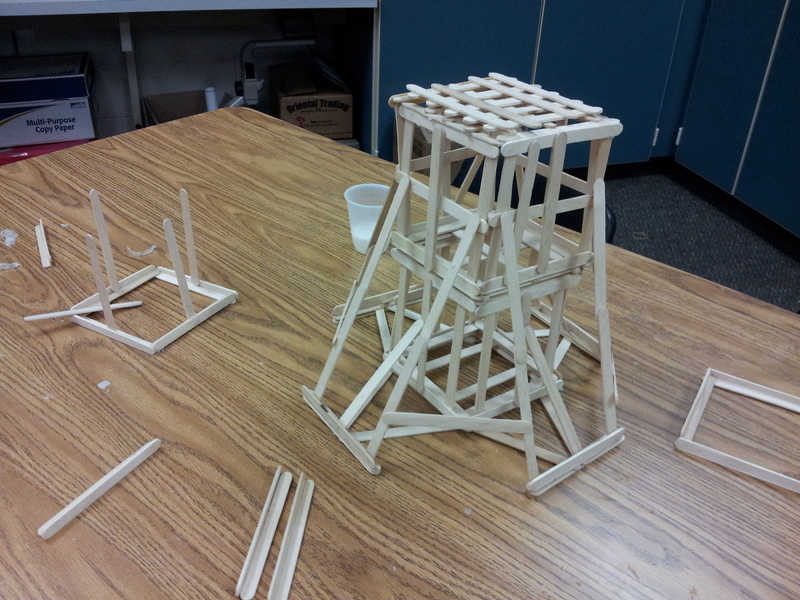 In two days we will test the strength of their towers and see who has the best design. I can’t wait to share their reactions with you!